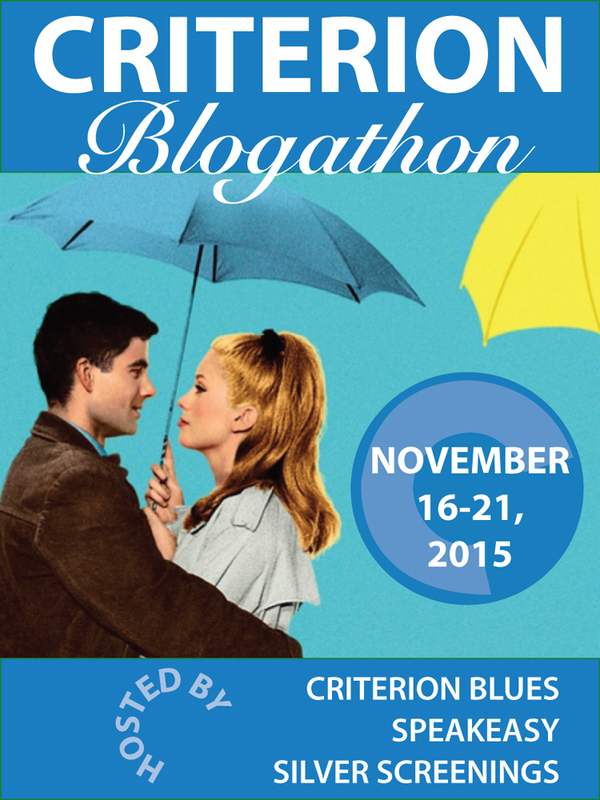 Along with Chaplin, Keaton and Lloyd, Jacques Tati is one of the great silent film comedians. The only difference of course being that Tati never actually made a silent film. Between 1953 and 1971, Tati directed four classic films revolving around the character Monsieur Hulot (also played by Tati). Supposedly named after “Charlot”, the name used in France for Chaplin’s character The Tramp, like Tati, Monsieur Hulot is a man out of time. Instantly recognisable by his hat, pipe, overcoat and stooping gait, Monsieur Hulot is constantly at odds with authority and technology. 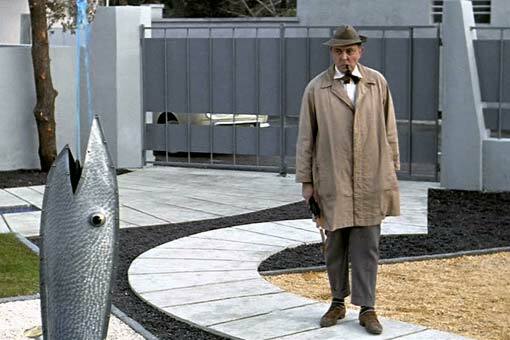 Mon Oncle (1958) was the second Monsieur Hulot film and the first in colour, it is also my favourite Tati film. 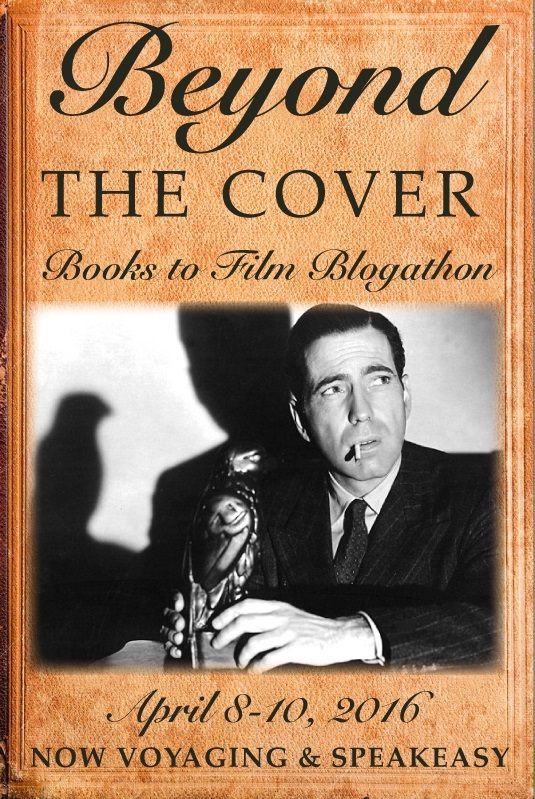 Critically well received on release, it won a special prize at the 1958 Cannes Film Festival, as well as the Academy Award for Best Foreign Language Film. Despite the title, the relationship between Hulot and his nephew Gérard is not the central focus of the film. Instead, Mon Oncle centres around Monsieur Hulot as he navigates awkwardly through an unfamiliar world of modernity and automation. 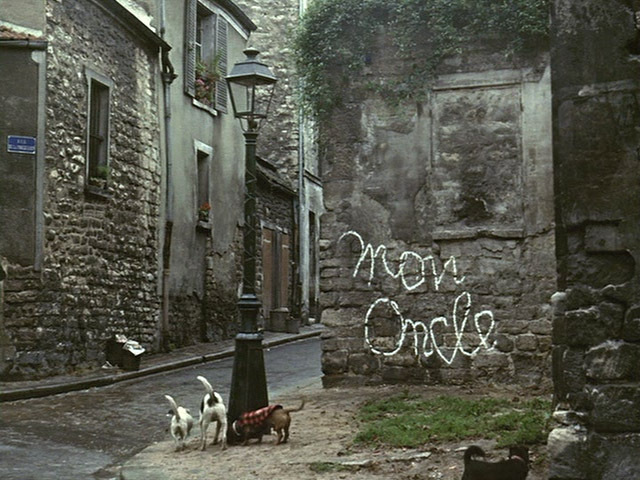 The world of Mon Oncle is wonderfully separated into two worlds: The vibrant natural world of the run down part of the city where Hulot lives and the sterile modern suburb of Hulot’s sister’s ultra-modern house, Gérard’s school and Monsieur Arpel’s factory. Through the wonderful opening sequence the film immediately brings us into these two contrasting worlds. The cast and crew credits are on a series of street signs in front of the construction of a modern high rise building. There is then a cut to an old stone building with the film’s title written in chalk on the wall. A group of dogs appear and mark their territory, going through bins and running through the dirty streets of the old part of town. They then follow a horse and cart to the broken stone wall that will mark the border between the two worlds throughout the film. Crossing this threshold the dogs are then in the clean modern world of the suburbs and its pristine streets. Breaking apart from the other dogs, a dachshund runs through a fence and introduces us to Monsieur and Madame Arpel’s absurdly designed super modern house. The film follows Monsieur Hulot through a series of adventures and misadventures in the two worlds. The unemployed and absent-minded Hulot is adored by his nephew Gérard and fretted over by his sister and brother in law who are constantly intervening to try and “improve” his life. Like The Tramp in Chaplin’s early sound films, Hulot is silent, with any conversations he has on screen inaudible to the audience. Hulot walks through the film wonderfully choreographed by Tati and often oblivious to the result of his actions. 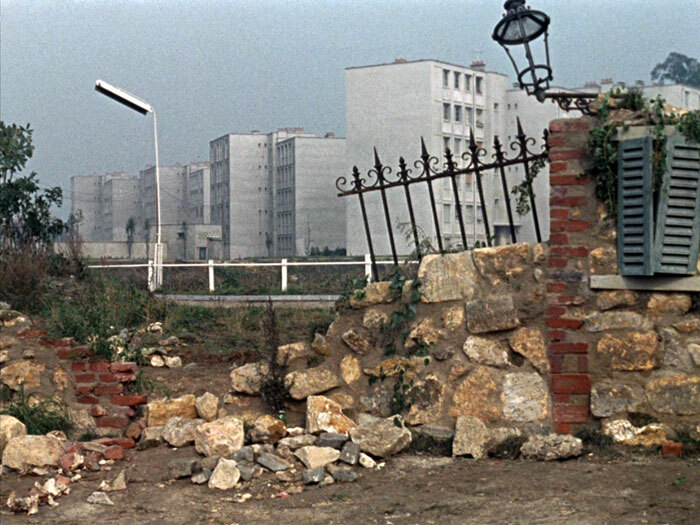 The film is divided between four basic settings: The run down part of the city where Hulot lives, the modern Arpel home with its various gadgets, the Plastac factory and outside Gérard’s school. Each of these settings has its own mood. The run down part of the city is relaxed and happy, there is a great camaraderie between Hulot and his friends and neighbours. Gérard always enjoys his travels about this area with his uncle and getting up to mischief with the other boys. In contrast the Arpel home is awkward and overly formal. Everything must be in its place and constantly cleaned, with the numerous gadgets often more of a hindrance than a help. The ongoing gag around the ridiculous fish water feature only being switched on for “important” guests is timeless, particularly when the husband sees it on when he arrives home and straightens himself out. There is also a wonderful contrast between the sleek modern Arpel house and Hulot’s rooftop dwelling on the top level of a ramshackle construction seemingly made from an ad hoc consolidation of two buildings. In order to travel to and from his apartment, he must traverse a complicated route through and around the other occupants of the building. The school and the factory are fascinating to compare. Both buildings look identical from the outside. However, outside the school the children get up to mischief at the expense of the adults and enjoy themselves, whereas the factory is overly formal like the Arpel house. The role of the workers at the factory is quite interesting, they are seen to be relaxed until Monsieur Arpel nears when they all uniformly do their job. The men react with hysterical laughter when Hulot wreaks havoc on the manufacturing process, but quietly work to fix the problem when they realise it may come back on them. Mon Oncle is one of those cinematic treasures that grow with every subsequent viewing. Tati’s choreography is so clever and subtle that there is always something new that I pick up every time I watch it. For instance on the last screening I noted more complexity in the role of the animals. There is the constant presence of animals in the more relaxed and “natural” environment of the Tati’s district. This is most obvious with the dogs that happily roam the streets welcome everywhere (except the factory), but in contrast to the industrialised suburbs filled with shiny modern cars, it is also very interesting to note the presence of the horse and cart. What stood out to me on the last viewing was that when the animals were being directed by humans (the dogs on their leashes, the horse being steered by his reins) their initial reaction is to resist and try to direct the human toward where they want to go. This resistance to authority by the animals is similar to that fondly represented through the young people in the first two Hulot films. Despite the resistance to technology and change central to the Hulot films, there is a fierce allegiance to the future through the championing of the joy and promise of young people. Children are shown to be happy at all times, except when under the regimented control of adults. The difference in Gérard when he is in his sterile home with his parents compared to when he is out with Hulot or playing with other children is beautifully realised. The way that this contrast is built up is superbly cut down in the witty (and moving) final scene where Gérard and his father share a moment of affection, when Monsieur Arpel (albeit accidentally) takes part in one of the pranks shared by the boys earlier in the film. 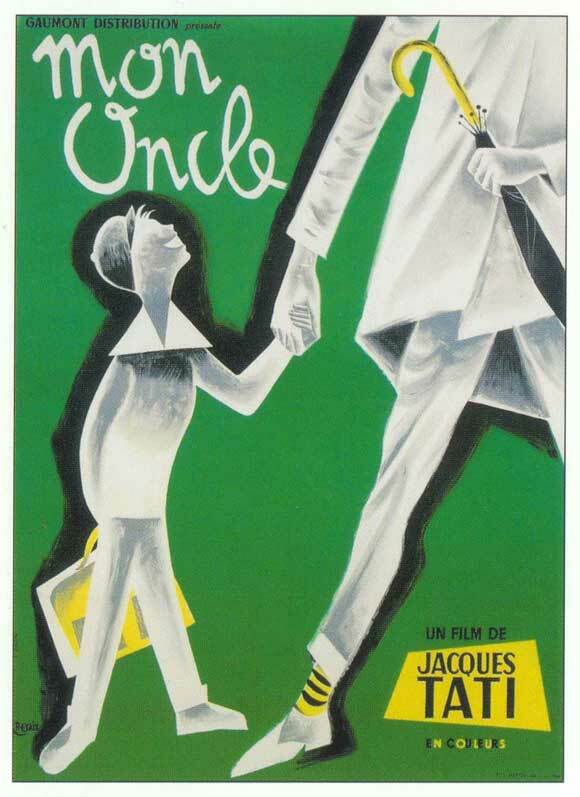 To me, Mon Oncle is the quintessential Jacques Tati film. It builds on the ridicule of snobbery and authority that was central to Les Vacances de M. Hulot, but also finds great visual humour in modernity and automation which was the main focus of Playtime and Trafic. While Playtime may be Tati’s greatest technical achievement, there is just a little more warmth and humanity on display in Mon Oncle.